Nanosolar aerial photos reveal module color variations. Doing the math pegs 200 Watt Nanosolar Utility Panels as dominating the 10.63 MW Alfarrasi project. 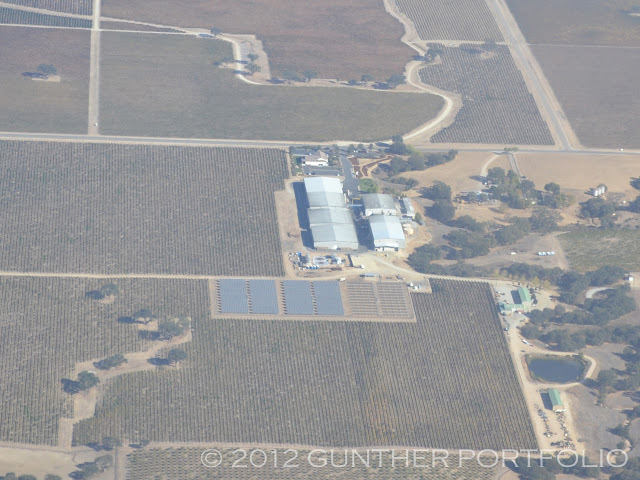 Bonus aerial photos of solar wineries. On the return flight from the Carrizo Plain via Paso Robles Municipal Airport for a break and to top off the fuel tanks, additional solar aerial photo opportunities happened upon our fight path. When my pilot asked if I had a preferred return route to the Bay Area, I suggested starting along U.S. Route 101 North. I knew the Camp Roberts Nanosolar Photovoltaic Project was located a dozen miles north of Paso Robles towards the east side of 101. Just outside of restricted airspace, I was able to photograph the Camp Roberts 1 MWp (MegaWatt-peak) solar photovoltaic (PV) plant with ease in contrast to the huge sprawling solar farms of the Carrizo Plain. Examining the cropped aerial photo above, the color variation in the 200 Watt CIGS (Copper Indium Gallium diSelenide) Nanosolar Utility Panels is quite apparent. In the past, I wondered if Nanosolar project photos had been retouched to blacken their appearance, and now I have independent photographic evidence. Even on the redesigned website, Nanosolar Inc. positions the Utility Panel for ground mount and commercial rooftop installations, so fine PV module aesthetics are not fundamental to Nanosolar’s branding or value proposition. The latest Nanosolar Utility Panel datasheet bins 220 Watt-peak as the lowest rated power corresponding to 11.0% module efficiency. I first saw one at the SunShot Grand Challenge Technology Forum. This would tend to imply current production is at least yielding 220 Watt modules. Although Nanosolar just announced the completion of the 10.63 MW PV project in Alfarrasi near Valencia, Spain, Nanosolar declined to comment on the efficiency of the panels used by the project. Dividing 10.63 MegaWatts by at least 50000 panels results in about 212 or 213 Watts per panel. So the majority of panels used at Alfarrasi appear to have been 200 Watt or 10% efficient depending on the exact number of panels “over 50,000” installed. 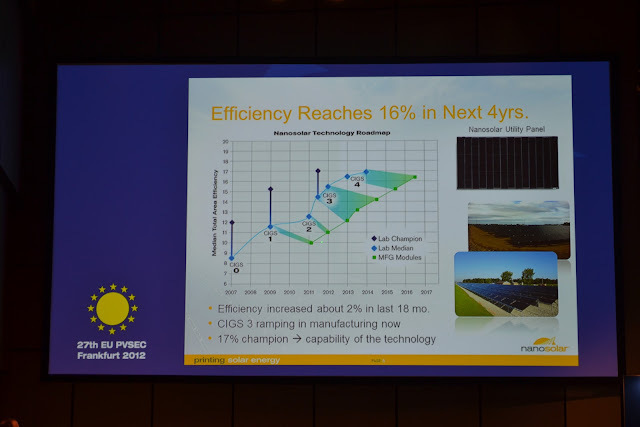 At the 27th European Photovoltaic Solar Energy Conference and Exhibition (EU PVSEC), Nanosolar Vice President, Research and Development, Dave Jackrel reviewed the Nanosolar Technology Roadmap in his presentation titled “Roll-to-Roll Printed Solar Cells: Up-Scaling from Laboratory to Megawatts of Production”. After ramping production of a 10% efficient module in 2011, Nanosolar said they manufactured about an 11% module from the CIGS 2 process in 2012 and were confident the manufactured module efficiency can move up to 12% and 13% in the next year with CIGS 3. The CIGS 4 process is currently under development for transfer to manufacturing in the 2015/2016 timeframe. Thus far, a utility scale PV installation using 11% efficient Nanosolar Utility Panels has not been identified. 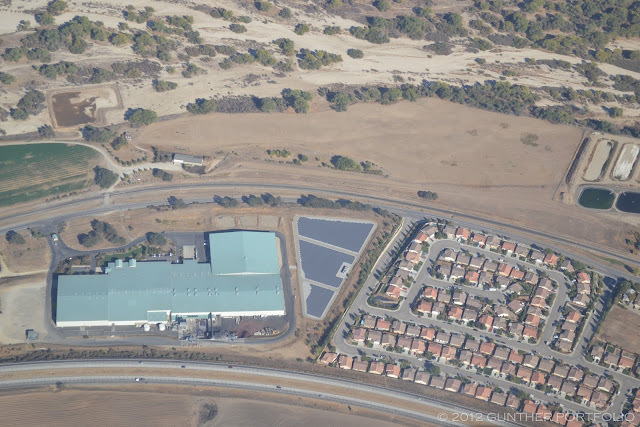 Not deterred by the earlier agricultural misstep, I managed to snap photos of three more solar installations, all wineries, identified via visual searches of Google Maps near Paso Robles. 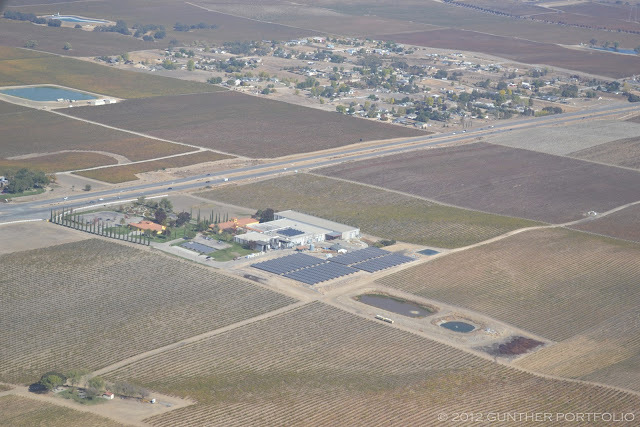 Broken Earth Winery was the first one sighted east of the Paso Robles Municipal Airport before landing. The winery has changed ownership a few times in recent years and is held today by a Chinese partnership. EOS Estate Winery, a prior owner, commissioned Conergy subsidiary SunTechnics to construct the 540 kiloWatt, single axis tracking, ground mount array and 60 rooftop solar hot water collectors at a cost of $3.8 Million in 2007. 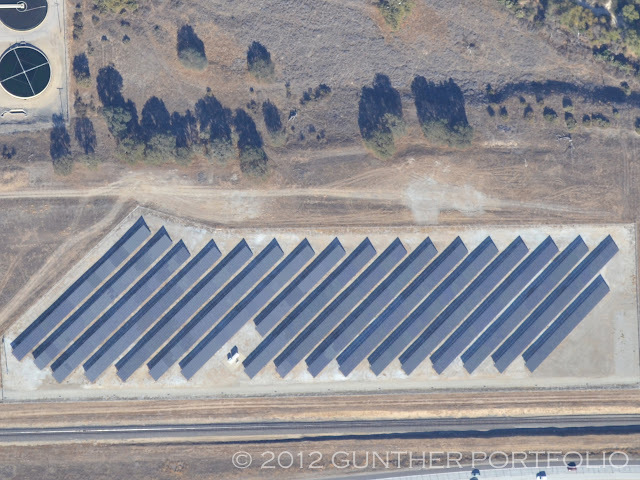 After takeoff, I spotted the solar tracking array at the J. Lohr Paso Robles Wine Center north of the airport. The 756 kiloWatt single axis tracking, ground mount array covers over 3 acres (~1.2 hectares) and was also built by Conergy. Photo analysis of the J. Lohr system indicates the southern third of the array was not tracking the sun! I asked J. Lohr if the solar tracker array was having trouble that day and has since been repaired, but I have not had my question acknowledged yet. 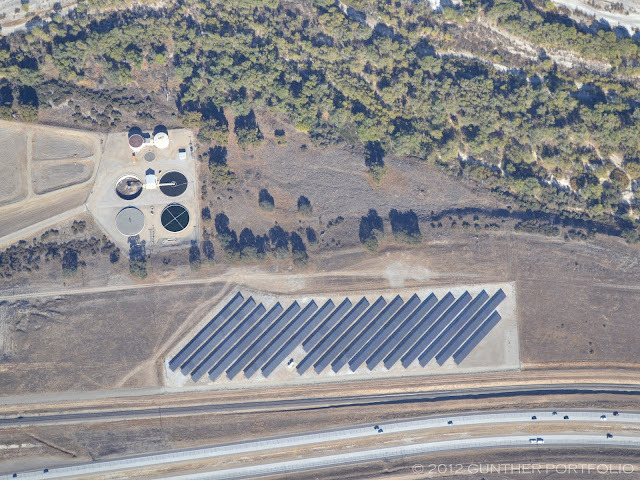 Just two miles south of Camp Roberts, I never noticed the Courtside Cellars 1.11 MW DC (996 kW AC) solar array driving past on 101. 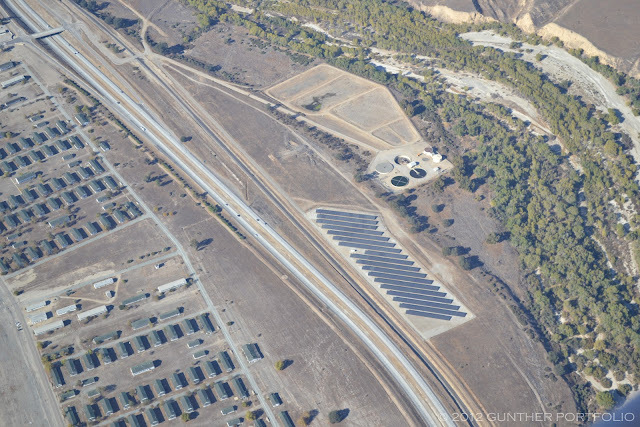 The fixed tilt, ground mount solar array uses 3640 SunPower Corporation (NASDAQ:SPWR) SPR-305-WHT-U 305 Watt modules per California Solar Statistics on 3 acres of land. Perhaps a blog reader in Valencia, Spain, or traveling through Alfarrasi would consider a site visit to the 10.63 MW Nanosolar PV plant to verify the module rating labels? As one of my teachers used to say, you will earn my utmost respect and admiration for accomplishing this task. © 2006–2019 GUNTHER Portfolio. All rights reserved.